The construction of the new Fire Boat at Almar Boats is moving forward. When complete, the 30' boat will represent the apex of marine firefighting capabilities between Portsmouth and Boston. With a 1250 gpm fire pump and design to compliment dive operations, the boat will be available to respond as a mutual aid floating fire / rescue truck. Delivery of the vessel is expected in late July. The Beverly Fire Department, Beverly Police Department, Office of the State Fire Marshal Fire Investigation Unit, and Bureau of Alcohol, Tobacco and Fire are seeking the support of anyone with information leading to the arrest and prosecution of those involved with causing the fire at 128 Park St on May 29. Through the Arson Watch Reward Program, anyone with information is encouraged to call 1800 682 9229 and pass along any information relative to the incident. �Anyone that provides us with information that helps us solve this case could receive up to $5,000.00 through this program� said Deputy Chief William Walsh the head of the Beverly Fire Investigation Unit. The fire investigators that worked at the scene found evidence to strongly suggest that the fire was not an accident. Although no one was injured by the fire, an estimated $1,000,000 damage was caused. 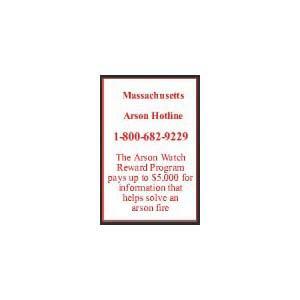 Attached is an image of a Arson Investigation hotline poster used with the permission of the Department of Fire Services.